I had two unsolicited, impressed comments from strangers who heard my tutoring sessions yesterday. It’s very gratifying: they’re more for my students than for me, but what teacher isn’t proud of the work their students do? In the morning, I was working on geometry with a 9 year old. We’ve been calculating the angle sums of star polygons like and . Since we used parallel lines to calculate the angle sum of a triangle, I thought it would be interesting to take a quick look into the history of the parallel postulate. 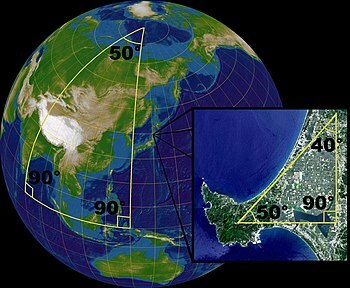 Long story short, there’s this amazing story when efforts to prove Euclid’s fundamental assumption about parallel lines led to people assuming they weren’t true: two new non-Euclidean geometries were developed in the 19th century, and the innovation was a sea change in our understanding of what mathematics, and indeed, thought, was. Somewhat surprisingly, the non-Euclidean geometries have turned out to be pretty useful. For example, one of them models life on a sphere. What are the differences? Well, angle sums of triangles no longer add up to 180 degrees! As we were discussing what straight lines would look like on the surface of the Earth (they’re NOT lines of latitude! ), this guy walked up and gushed about how awesome it was that we were talking about non-Euclidean geometry, and how he hadn’t learned it until he was much older. half the light you shine on it back, and passes half of it onward. If you were to take two 50% mirrors and put them side by side, he wondered, what would happen if you shined a light in? Would the light bouncing back and forth between them last forever? Notice that what’s bouncing back and forth on the inside gets cut in half after each bounce. Does it ever vanish completely? That was his question, and he was aware that though it gets incredibly tiny and incredibly close to zero, the energy of the light in the middle never fades away entirely. It’s a subtle issue, actually. Looking at the picture, I suggested another question: how much of the light goes to the left, and how much to the right? To answer this, you either need to be able to figure out what 1/4+1/16+1/64+… is, or what 1/2+1/8+1/32+… is. Or, you could be very clever and notice that twice as much comes out the right side as the left side, since 1/2 is twice 1/4, 1/8 is twice 1/16, and so on. But all (“All except that infinitely small bit inside,” he reminded me) of the light goes to the left or the right. To write this situation down clearly, we decided to use some algebra. Let’s all the amount of light that goes to the left X. Then the amount that goes to the right is 2X. But we also know that the total of these two amounts must be 1 (or infinitely close to 1). So X+2X = 1. Of course, this just means that 3X=1. So X=1/3. Magically, a little algebra untangled the puzzle completely. We now know that 1/3 of the light goes to the left, and 2/3 goes to the right. We did this again with 25% mirrors, which was much, much more technically involved. My student hadn’t worked that much with fractions, but by the end he had figured out how to divide 9/16 by 1/4 (he got 2 and 1/4 as his answer by drawing the picture below. Note that each small square is 1/16 of the whole square). He also figured out what 1/5 of 3/16 was in a similar fashion. I think out final answer to the problem was 3/5 of the light goes to the left and 2/5 goes to the right (though we haven’t reduced the fractions yet… that will be for next time). When we were done, a woman who had been working next to us struck up a conversation with me, amazed at the technical and conceptual complexity of what my student had been able to do. Algebra, fractions, infinite sums, infinitesimals, not to mention the sophistication of the model, and the idea itself. Now both of these students, for all their youth, are brilliant, and not any kid could deal with the kinds of calculations and concepts they handle. That said, I think the method of motivating the math by have kids ask questions and finding the problems from there is extremely powerful. All my students know that I’ll take their questions and ideas seriously, and when they bring me their ideas and respond to what I show them with questions of their own, they’re buying in to the activity of mathematics. This is a recipe for kids who own their knowledge, who are not afraid to think, and who, in the end, are stronger mathematicians than their peers in every respect. You sometimes need to nudge their questions into the right shape, of course, and there’s some subtlety to that. For example, I was the one who asked how much light would go to the left and to the right in the 50% mirror question. At the end, I also asked what type of mirror would result in precisely half the light going to the left and half the light going to the right (a very tricky, but natural question. A similar but conceptually different question is: can you argue that some type of mirror will send half the light to the left and half to the right without necessarily knowing what mirror it is?). Still, I think everyone who teaches should find a way to solicit questions from their students, and to take them seriously. The gain is so enormous. I had never taught my second student to divide fractions, and I didn’t ask him to try; he needed to divide fractions to answer his own question. When a student is motivated like that, they learn fast, no matter where they start, and nothing motivates like ownership. Another thing we noticed about the 50% mirrors is that if light hits one from both sides, the 50% mirror will average out the two beams and send half to the right and half to the left. “I have a lot of questions about this,” my student said. I had him write some of them down at the end of the lesson. Next week, we’ll start with those questions. So many questions arise from this one question and so many lessons can be taught from this one. You have a good thing going there. What a thought provoking avenue.